Wing and A Prayer Design is pleased to introduce Queen and Her court II, a very special 10th Anniversary quilt design. Originally released in 2009 as a 12 month program, the Queen and Her Court pattern has been updated with fresh block designs and piecing techniques to reflect today's quilting styles yet maintaining its original traditional styling and beautifully appliqued flowers and vines. This new version is a gorgeous blend of Impromptu Mix and Just Mined fabrics both designed by Faye Burgos for Marcus Brothers. Her rose, blush, sage, grey and neutral florals on black with stylized coordinates are perfectly paired with her marble patterned texture prints in similar tones. This is a 12 month program that begins in February of 2019. 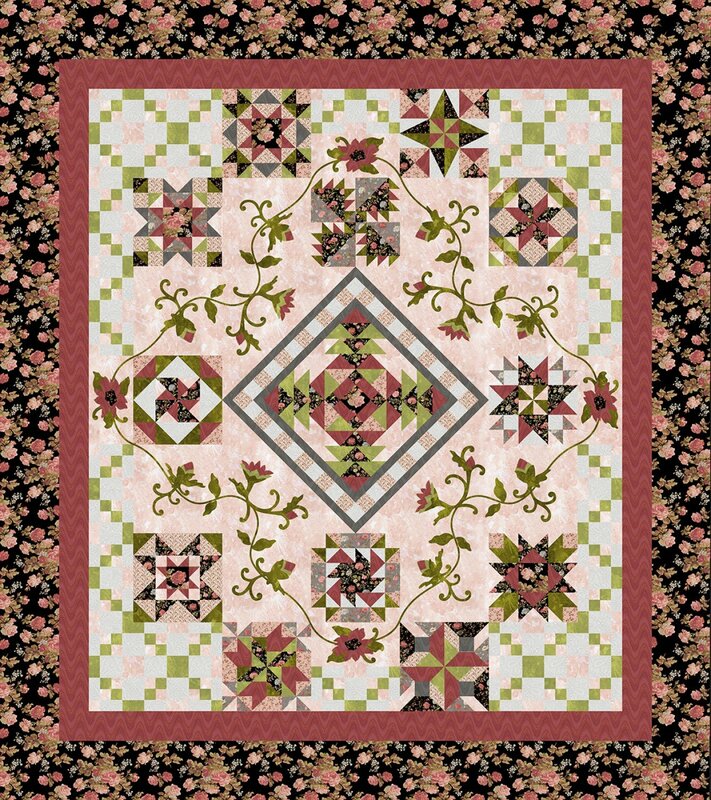 In this program, you will receive all of the fabrics for the top of your quilt including the binding and all the patterns needed to complete this quilt. Fees: $ 24.95 per month plus shipping OR all at once and we will pay your shipping.